Teff grass is a member of the genus Eragrostis (lovegrass). The seeds are small, about the size of poppy seeds (less than 1mm diameter. This small size limits their use, but they are very nutritious and worth the extra trouble to use them. 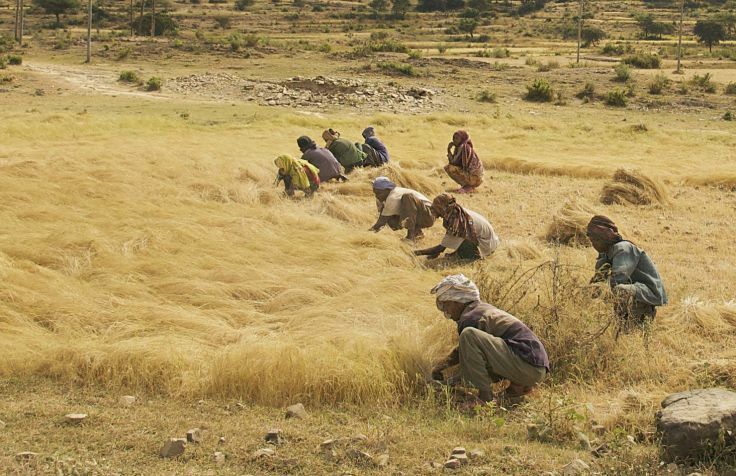 Teff is a native of Ethiopia and Eritrea, and can be grown over a very wide range of altitudes (sea level to 3,000 m). Teff is now grown in India, Europe, Australia, Canada and America. The seeds range in color from white to yellow, red to dark brown. 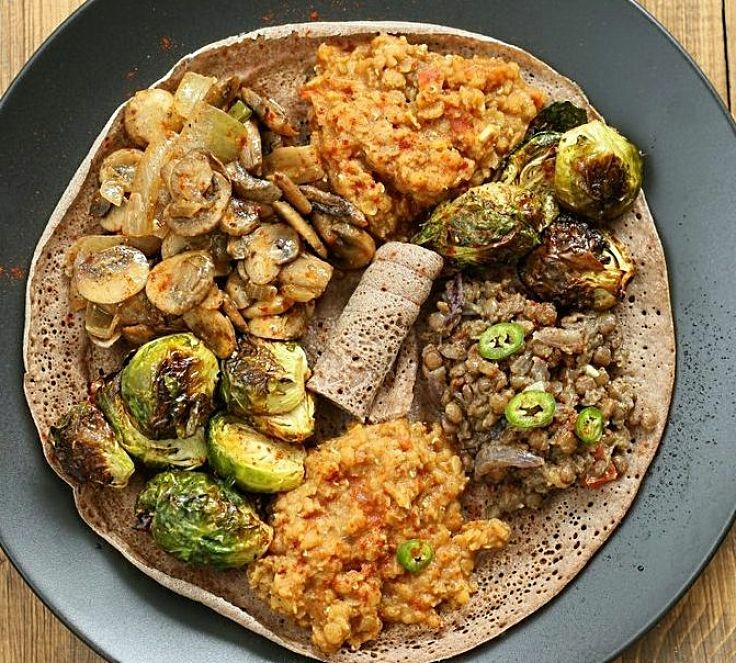 The darker grains have stronger flavor In Ethiopia, teff is traditionally ground into flour, which is fermented to make sourdough flat bread. In the modern world, teff is used as an ingredient in pancakes, flatbreads, wraps, healthy snacks, cereals and breads when mixed with other grains. 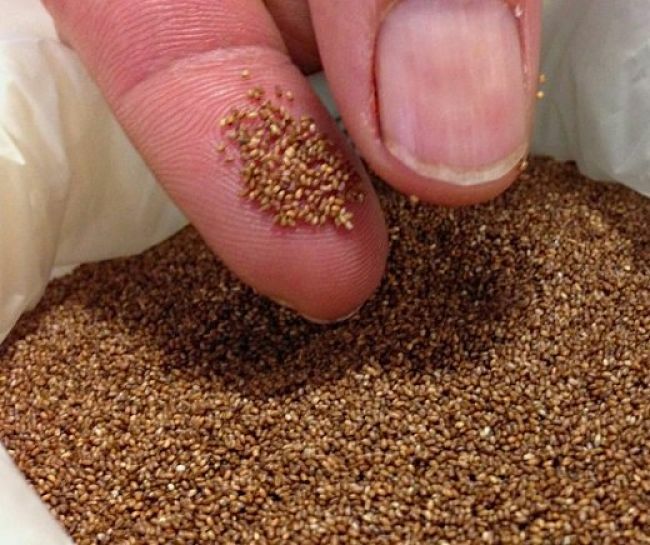 Teff is gluten-free and this added to its appeal in the health food market. There are a lot of myths about the health benefits of teff which has been proclaimed as a super-food. This article aims to dispel the myths about teff by comparing its nutrition values with seven other grains: Amaranth, Pearl Barley, Oats, Quinoa, Rye, Triticale and Durum Wheat. It also includes a guide for using teff, and some fabulous recipes. 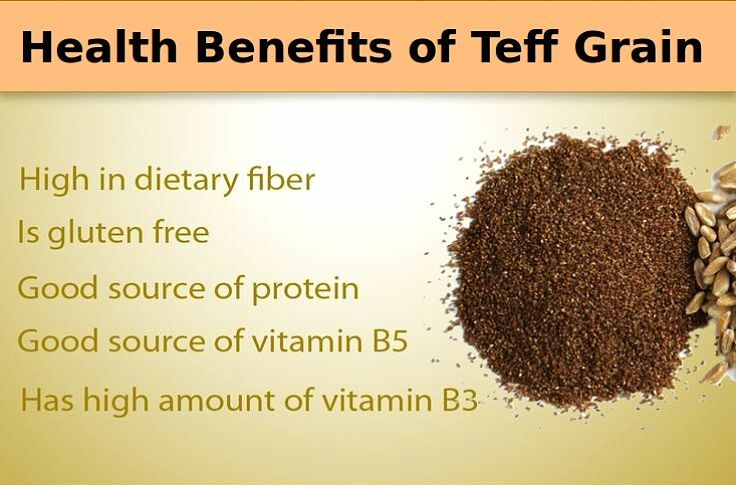 ► Despite all the hype, teff is relatively poor in Vitamins. Apart from Riboflavin and Thiamin the levels of vitamins are lower than for the other grains such as oats and quinoa. 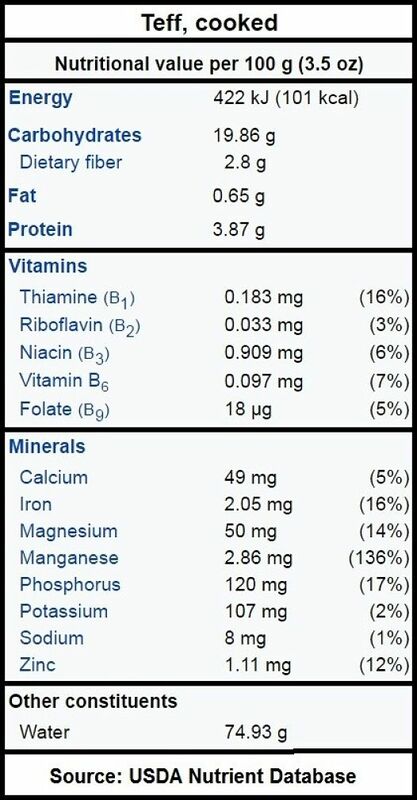 Folate level are very low. 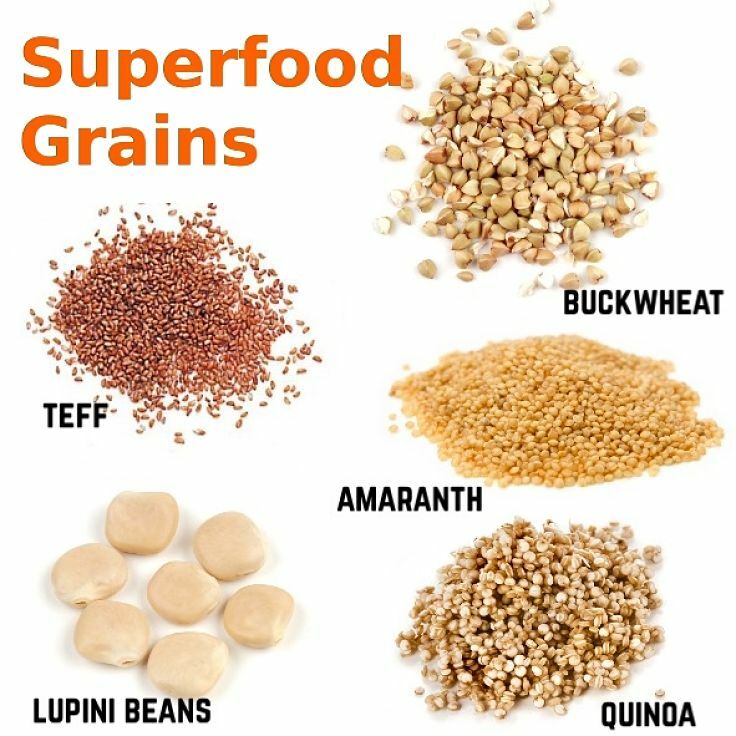 ► Teff has very low fat levels, but is a good source of protein and fiber, though no more than for most of the other grains in the table below. ► Teff really excels for minerals. The level of calcium (180 g/100g serving) is far higher than for the other grains. 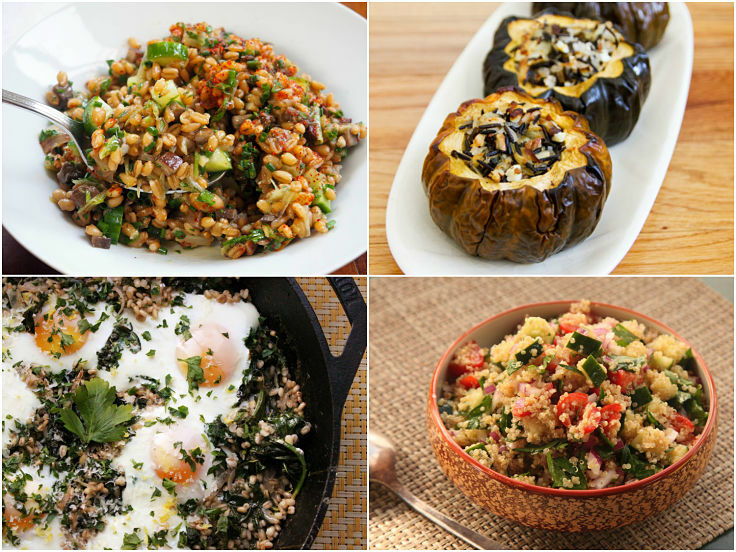 Zinc, copper, manganese and iron levels are all much higher than for the other grains. ► Teff contains a form of starch that is resistant to digestion, which means it releases sugar into the blood stream more slowly than for other grains. This assists with weight control. ► The tiny grain of teff means that it is always eaten as a whole grain and this has advantages compared with highly processed wheat flour, where the nutrition bran and wheat germ is removed. Teff is a good source of protein for vegans. Teff can be dry cooked and then let to absorb water like couscous, for adding to pasta sauce, soups, casseroles, curries and even adding to salads. Roast the teff grains in a hot dry pan for 5-6 minutes. Then transfer to a bowl and add 1 cup of boiling water for each cup of teff. Cover and set aside for five minutes. To boil teff, add 3 cups of water to each cup of teff, with a pinch of salt and boil, stirring occasionally for about 20-25 minutes. Boiled teff can be added to oatmeal as a breakfast cereal. Raw or cooked teff can be added to cookies, muffins, pancakes and flat breads. Mix together the yogurt, syrup, eggs, baking powder, spelt flour and teff grain in a small bowl and set aside for 15-20 minutes. To cook, heat the rice bran oil in a small pan over a medium heat. Add heaped tablespoons of the batter at a time, into the pan. Lift the pan and swirl to distribute. Spoon some berries on top of the pancake, so that they will be incorporated. Wait until the pancake bubble start to pop, then carefully flip the pancake over, and cook the other side until dark golden brown. Serve with maple syrup, extra berries and dollops of Greek yogurt. Combine the vanilla, maple syrup, apple butter, egg, oil and nut butter in a food processor and mix briefly (or use a hand mixer or a stand mixer. Do not overmix. Next add the salt and teff flour and combine well. Using a tablespoon, remove some mixture and roll into balls. Place on a greased cookie sheet and flatten a little with a wet fork. Bake in a pre-heated oven set at 350 degrees F (175 degrees C) for 10-15 minutes. Preheat oven to 350 degrees F (175 degrees C). Mix the dry flours, cinnamon, salt, baking powder and baking soda with a wooden spoon. Beat the butter and sugar eat using a stand mixer, hand mixer or food processor speed until well blended, about 2-3 minutes. Then add the egg and mix again, and then the water. Add the flour mixture into the bowl with the sugar mixture and beat gently at low speed until just blended. Add the chocolate chips and stir through. Transfer the cake batter to an 9-inch (20cm) greased loaf pan, lined with baking paper. Bake for 50 -65 minutes, or until a skewer inserted in center comes out clean. Remove from the oven and cool in the pan for 10 minutes on a wire rack. Then carefully remove from pan and cool the cake on a wire rack. Serve just warm. Place the yams, teff, water and salt in a 4-quart (4 liter) stockpot and bring to the boil. Then lower the heat and simmer slowly, covered for about 20 minutes. Next add the oil, cumin, leeks and fennel to a medium size frying pan and sauté for 2-3 minutes. Add the collard greens and sauté for another 2-3 minutes. Add this mixture to the teff mixture, cover, and simmer gently, while stirring, until all of the liquid is absorbed (generally 3-5 minutes). Remove the pan from the stove, mix in the cilantro and basil. Season with salt and freshly ground black pepper. Then spoon the mixture into an 8-inch (20 cm) loaf pan. Press to shape and set aside for about 30 minutes, to form a firm loaf. The loaf can be carefully removed from the loaf tin onto a platter to serve or left in the pan.